Upon landing, four more terrorists joined the group, and they proceeded to separate the hostages. All the Jews were herded into a recently abandoned terminal building. The rest of the passengers were released and flown to Paris. The Air France crew decided to stay behind with the Jewish hostages. The number of hostages, including the crew, totaled 106. The hijackers immediately issued an ultimatum: Either release 53 terrorists held in Israel and four in other countries, or all the hostages would be killed on July 1. The Israeli government launched negotiations with the terrorists while considering a military alternative. As a result of the negotiations, the hijackers agreed to extend the deadline to July 4. A military alternative was considered by most to be unthinkable, mainly because of the great distance involved — 2,500 miles from Tel Aviv to Entebbe. Nonetheless, the Israeli Cabinet ordered the preparation of a rescue mission while they used the negotiations to stall for time. As it turned out, the Israelis had two advantages working for them. They were able to interview all the passengers who had been released, and from them they got detailed information about the captors and the hostages. They also discovered that the abandoned terminal building had been built by an Israeli company, so they were able to get the blueprints of the building! Lieutenant Colonel Jonathan (Yoni) Netanyahu was selected to lead the commando assault team. He was the older brother of the man who would later become the prime minister of Israel — Benjamin Netanyahu. Although Yoni was only 30 years old, he had accumulated an outstanding record of military leadership and daring. To prepare his team for the attack, he came up with the idea of using hay bales to lay out the exact floor plan of the terminal building, and his commando team began practicing mock assaults. Four Lockheed C-130 Hercules aircraft, plus two Boeing 747s were used in the raid. More than 100 personnel were recruited and divided into teams. Yoni's assault group consisted of 29 elite commandos. A second group was assigned the job of encircling the new terminal building and immobilizing the Ugandan soldiers attached to it. A further group was given the task of destroying all the MiG fighter planes on the ground at the airport. A fourth group was given the task of refueling the airplanes, and a fifth squad was put in charge of evacuating the hostages. The mission was launched on the afternoon of July 3. The planes flew most of the way at an altitude of only 100 feet in order to avoid radar detection. The flight took 7 hours and 40 minutes. They arrived one minute behind schedule at 11:01pm Israeli time — but just after midnight in Uganda, the beginning of July 4, 1976. Five Israeli commandos were wounded. 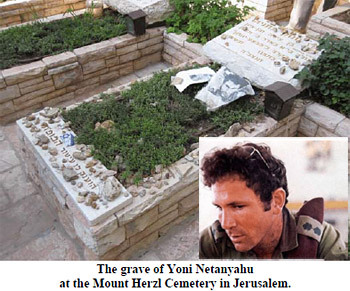 Only one was killed — the leader of the raid, Yoni Netanyahu. The entire raid, including the refueling of the planes and the evacuation of the hostages, took a total of only one hour and 39 minutes.26 To this day, this amazing raid is considered to be one of the most outstanding examples of military planning, coordination and execution in the annals of military history. In the sixth segment of this series on the resurgence of the Israeli military as a sign of the end times, we will look at the evidence of the fulfillment of this prophecy through Israel's Operation Opera.